I don't know about you, but it seems to me like spring is slow in coming this year. How I long for a few consistent days of warm temperatures and sunshine. We are getting a pretty, warm day here and there, however. And I'm trying to relish them as they come. Saturday was such a day here. And everyone was outside. I stopped to chat with my neighbors as they pruned the apricot trees in their yard. Our own apricot trees had been pruned so well last year, that they really didn't need tending to this year. So I was content to chat and watch and soak in the sunshine. Then I came back inside to finish my spring cleaning. Blech. 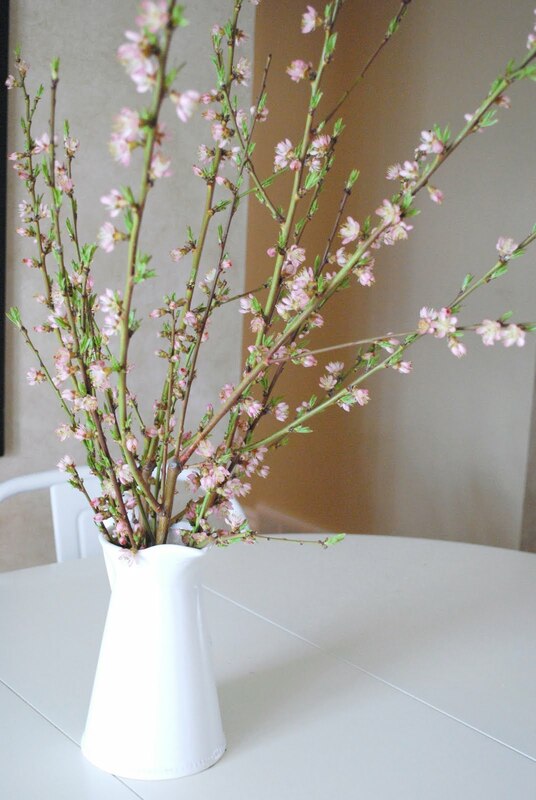 I was busily working away when the doorbell rang, and my lovely neighbors stood there with a bucket of apricot branches just full of tiny blossoms waiting to bloom. They offered me several branches because they just couldn't bring themselves to throw them away before they had a chance to bloom. So I took them and decided to place them in water and see if I could force blooms. My neighbor promised me that with water and the warmth of the house, those branches would bloom in no time. Boy was she ever right! I didn't even have a chance to get a photo of the branches with all of their buds tightly shut. By the very next morning, they had already started to bloom. And now, as I write this, two days later, the blossoms are open wide....lovely and sweetly fragrant. What a beautiful way to bring spring inside. So despite the cool rain that fell all day outside, I sat working at my dining room table enjoying mother nature's splendor with a few blooming branches. Do you have blossoming trees? 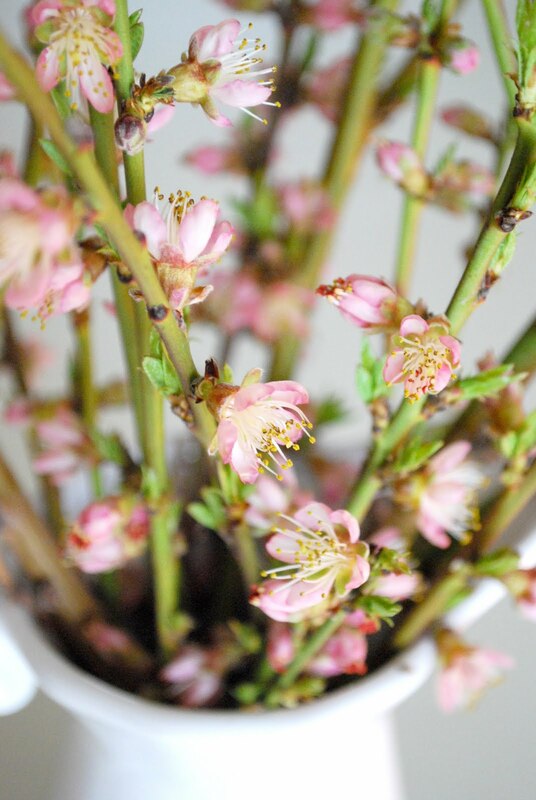 Consider bringing the branches you prune inside and forcing blooms of your own. What a lovely tribute to spring. so pretty... lovely flowers ! we are lucky overhere : almost 2 weeks of very sunny summerdays early in spring ! Normally it's not that hot here at this time of the year and certainly not so many days ! So i'm enjoying spring very much right now and wish you the same sunny weather ! So pretty! 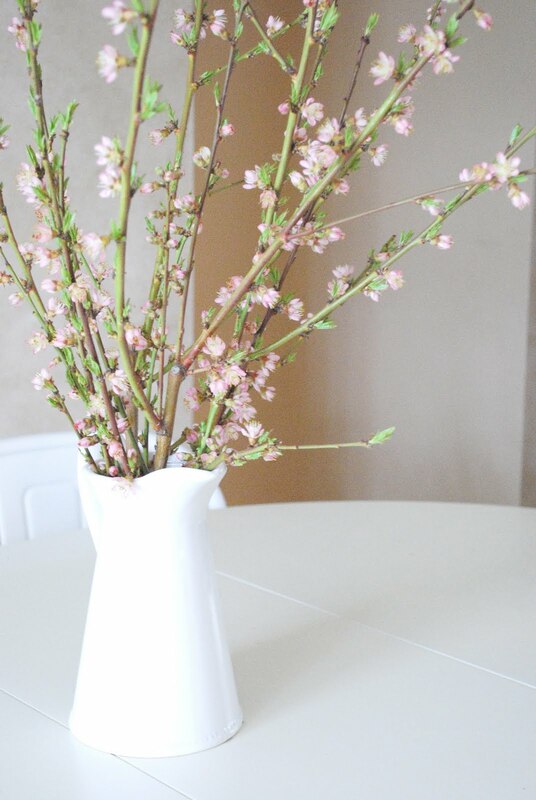 Love the vase too :) It all screams "spring" !! Oh! Guess what I will do tonight!? Thank-you again for another lovely post. We're meeting with our contractor tonight about an addition and I've made a whole whack of notes of finishings from your blog. These are gorgeous. Thanks so much for that tip. Who would have known. I love those blossoms. Your blog is beautiful! So glad to have found it. I just LOVE your style.